Owing to its patent pending magnetic linking device, the Area modular system offers infinite solutions for any environment. Now, the modules also come with a higher back, creating even more flexible areas of use. Area High back creates a room within the room itself. The upholstered product with its high back also works as a sound-absorber. Area offers new dimensions to all kinds of creative meetings of today. Area High back works equally well in different constellations, linked together or as a solitaire. Using the same linking device for all modules, the Area high and low units can now also be combined to create exciting and unexpected expressions. 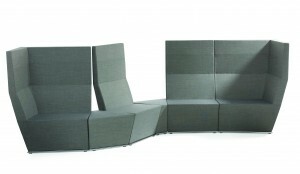 There is also an easy chair to go with the modular system. The design is timeless. Diagonal lines in shape and upholstery give a graphic, playful touch to the piece of furniture. The frame is visible and creates a nice pattern along the floor when several units are linked together. The patented linking device is a unique solution where the units are linked together with strong magnets, hidden behind the upholstery of each piece of furniture.